The tradition continues of the Arizona Diamondbacks paying homage to Star Wars this month. 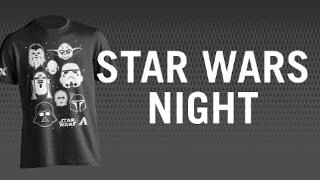 On May 14th, the Diamondbacks play hosts to the San Francisco Giants at Chase field and the first 20,000 into the facility will get a limited edition Star Wars/Diamondbacks tee shirt. The night is usually filled with Star Wars graphics on the scoreboard, Star Wars music during the game and more Star Wars celebrations.